Spending on rehabilitation results in improved and affordable housing stock, urban revitalization and inner-city development, reduced automobile dependence, open space conservation, and reduced pressure on landfills. Cities that have a good stock of historic buildings have greater opportunities for heritage tourism, a key feature in history-rich Virginia. Heritage tourists stay longer, visit twice as many places, and spend more than twice as much money as other tourists. 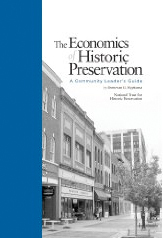 Read more in: The Economics of Historic Preservation: A Community Leader's Guide. Since its inception in 1976, the Federal Rehabilitation Tax Credit has encouraged the rehabilitation of more than 31,000 historic properties representing over $31 billion in private investment.